Although both teams qualified for the National Invitational Tournament (NIT) in late March, they fell far short of early lofty expectations, and coaches and players will spend the off-season trying to understand why. 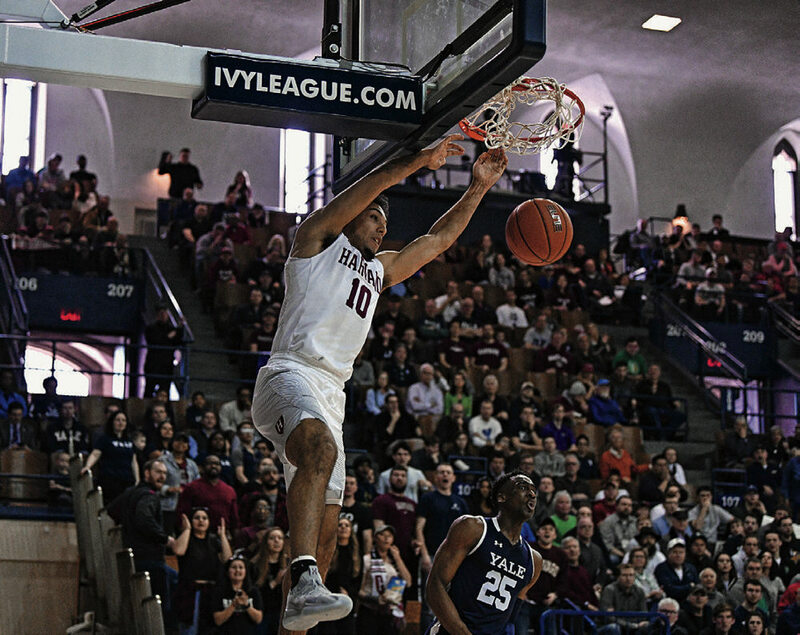 Coach Tommy Amaker and point guard Bryce Aiken ’20, a first-team All-Ivy honoree, led Harvard to a share of the Ivy League championship. These predictions assumed that the team’s best players—Aiken, the 2017 Ivy League Rookie of the Year, and Seth Towns ’20, the 2018 Ivy League Player of the Year—would recover from last year’s season-ending injuries. Instead, neither suited up for the season opener against MIT, when they were listed as out indefinitely. Without them, the Crimson initially performed unevenly. The highlight was a 74-68 win at St. Mary’s, a perennial mid-major power that had throttled the Crimson 89-71 the previous year. But there was also a low point: Harvard’s 81-63 setback at Dartmouth, the first time in 12 years that the Crimson lost its conference opener to the Big Green. The game signaled a serious problem: porous perimeter defense. Dartmouth shot above 60 percent from the field and more than 50 percent from three-point range—not the kind of defensive prowess that had suffocated Ivy League opponents in previous years. Aiken returned in the next game, at Howard, and immediately made his presence felt, sinking a three-pointer to get Harvard on the board and pressuring the Bison defense. This created opportunities for his teammates, and with all five Harvard starters scoring in double figures for the only time this season, the Crimson cruised to an 84-71 victory. But an offense so heavily reliant on one player was not enough to win the Ivy tournament, especially given the team’s injuries (Towns announced in March that he would not play this year) and defensive lapses. In the championship game, only one other Harvard player, Ivy League Rookie of the Year Noah Kirkwood ’22, scored in double figures to go with Aiken’s 38 points. Five Yale players scored in double figures—and seven had eight or more points. That balance, paired with Harvard’s difficulty defending the perimeter, enabled the Bulldogs to score 97 points (the most Harvard has given up since Amaker’s very first game, a 111-56 Stanford blowout in 2007) and pull away from the Crimson for the victory. Because they were the top seed in the Ivy League tournament, the Crimson received an automatic berth to the NIT, the second-most prestigious post-season tournament. Harvard upset Georgetown 71-68 before losing by one point to North Carolina State in the second round. The women’s team finished third in the pre-season media poll, but Delaney-Smith had her sights set higher. “I don’t know of a basketball component that we need that we don’t have,” she said in an interview then. The team’s strengths showed clearly in December when the Crimson defeated then-fourteenth-ranked California, Harvard’s first win over a ranked opponent since 1998, when the sixteenth-seeded Crimson knocked off Stanford, a one-seed, in the NCAA tournament. Next season, coach Kathy Delaney-Smith will have to replace a talented group of seniors, including guard Sydney Skinner ’19. As disappointingly as this year turned out, there is good news. In 2017 and 2018, the Ivy League tournaments were played at Penn’s Palestra, the “cathedral of college basketball.” This year, the competitions were held at Yale’s Lee Amphitheater, in Payne Whitney Gymnasium, the “cathedral of sweat.” Next year, the event will come to Lavietes. The Crimson’s 1,636-seat gym is no cathedral, but Harvard excels at home. Point guard Katie Benzan ’20 was named to the All-Ivy first team for the third consecutive year. Then again, there will be added pressure. The men’s team has seven rising seniors, whom ESPN rated as the country’s tenth-best recruiting class in 2016. Basketball analysts predicted they might lead Harvard to the Sweet 16, but they have yet to reach the NCAAs. The women’s team also boasts talented rising seniors, especially Katie Benzan, a three-time, first-team All-Ivy point guard, and Jeannie Boehm, just the third McDonald’s All American in Ivy League history. Many thought they would return Harvard to the NCAAs for the first time since 2007, but they have yet to do so. Next year represents a chance for both senior classes to realize these expectations on their home floor, but they will still be sweating the outcome—their window of opportunity is closing.